Over the past few months I've been involved in a project at my children's primary school to set up a prayer spaces project. Prayer Spaces in Schools is an initiative aimed at enabling young people of all faiths and none to explore their spirituality in a safe and interactive way. The idea is that an area of the school is transformed for a few days with several prayer stations set up for the children to explore and reflect. My children attend a Roman Catholic school and prayer is part of daily life, but the prayer stations give all the children an opportunity to experience the many different ways you can interact with God. And for those of no faith, the prayer stations provide a valuable place to reflect (vital in today's busy world). Unlike most school-based activities, developing the prayer spaces project has been a real community effort. To start with, we thought about who we could invite from the local community to help develop, set up and facilitate the various prayer stations. Although it is a catholic school, children from many different denominations attend, so we invited members of local churches to our preparation meetings as well as some parents, members of the parish, staff and governors. Once we'd agreed a date, we explored the school to decide where we would set up the prayer spaces. Then we all brought different ideas of prayer spaces we could create. We decided a loose theme (the five senses) and agreed on the prayer station activities. Once we'd finalised each prayer station we divided up into teams to source the materials we would need and agreed a timetable so we had helpers to guide the children through the activities. Jelly Bean Prayers: the children are invited to pick a jelly bean from a jar and say a prayer depending on its colour while the eat the sweet. Taste And See: The children are invited to experience different tastes (sweet, bitter, hot, sour etc). Each taste relates to a different prayer: something they are thankful for, something they are sorry for, a time when they may have lost their temper, a time when they have held a grudge. They then pick a prayer and write it on a post it note and stick it to the wall. Refugee Boat: The children are invited into a boat covered in tarpaulin and asked to think about how it must feel to be a refugee and to pray for refugees around the world who are fleeing for their lives across the sea. Bubble Tube: The children are invited to focus on a bubble in a bubble tube and to pray for someone or something as they watch their prayer bubble rise up (to heaven). Smelly Prayers: The children are invited to experience different smells (lavender, lemon, cut grass, coffee etc) and asked to consider what the smells make them think of. They are then asked to pray about the diversity of God's world. The Empty Chair: The children are asked to think of someone they have lost (and thus no longer occupies a chair) and to write their name on a post it note and to pray for that person. Music Makers: The children are asked to play on drums and tambourines and instead of praying they are asked to just live in the moment and perhaps repeat a mantra that they come up with. This is about introducing children to the idea that you don't always need words to pray and be close to God. To introduce the children to the idea of prayer stations, the head teacher held a special assembly where she explained what would be happening and then asked the children what they thought prayer is and where they pray. The reaction from all involved in the prayer spaces project has been phenomenal. The children have been really enthusiastic about participating in the project and have thoroughly enjoyed exploring the many different ways there are of being close to God. They have also enjoyed the opportunity to have some space to reflect and to experience mindfulness. The adults have also been moved, some quite emotionally, by the activities (particularly the empty chair) and found it a cathartic and refreshing project. While the school already has numerous permanent prayer spaces, the installation of temporary prayer spaces refreshes the idea of praying and has been hugely beneficial to all involved. 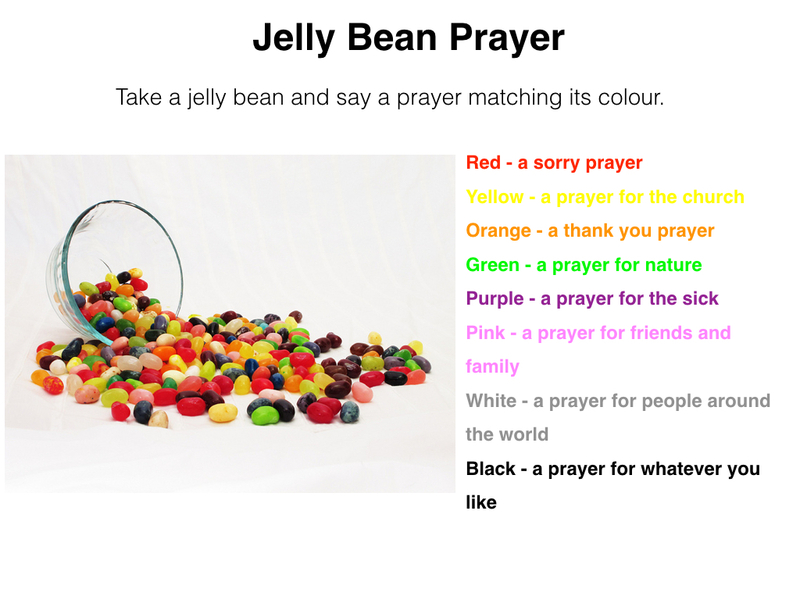 There are many more resources about prayer spaces on the Prayer Spaces In Schools website and there are plenty of ideas for interactive prayer activities on Pinterest. It's been such a success, we plan on repeating the project. Please do share any prayer activity ideas and let me know if you are involved in prayer spaces.